A lean, healthy red meat, straight from the wild Australian Outback to your front door. ‘Roo meat is tender, flavorful and enjoyed by millions of meat lovers around the world. Kangaroo tastes similar to venison. It’s gamey but not quite as dry. Available to buy as steaks, burger patties, sausages, large primals and more. Kangaroo meat is lean, so cook it rare or medium rare for wonderfully tender, juicy ‘roo, anytime you want it. It’s also known as Australis. 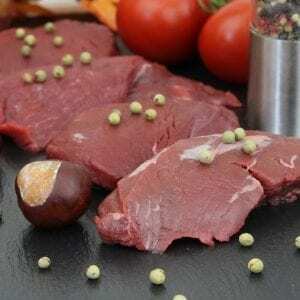 What does Kangaroo Meat taste like?